This is a map showing the North Sea from North Holland (Zuidersee) to Boulogne and Dover to Tynemouth. 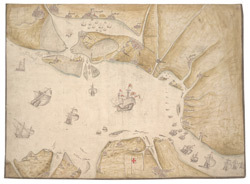 It dates from September – October 1539 and is likely to have been drawn by the cartographer John Borough with decorative ships drawn by the King’s painter Anthony Anthony. John Borough was a sea man who possessed a wealth of knowledge on navigation. He was occasionally employed to sail along the Flemish coast to look for enemy ships. By 25th of October Henry VIII was reported as ordering the Calais authorities to prepare for Anne of Cleves who would journey to England via the English outpost. It is possible that this map could be the presentation copy for the Cleves envoys, illustrating how Anne of Cleves could be safely transported from north Holland to England. Vignette views of towns feature, with London seen from the Thames, where Anne would be deposited. The small ships that are drawn in the Zee and the large English ships with Royal standard outside, support this idea as they illustrate how Anne could be transferred from different sailing vessels. A squadron is shown blocking the channel from Dunkirk to Dover making possible a landing for Anne at the mouth of the Thames. The scale of the map is varied, with Zuidersee being drawn at a larger scale than elsewhere.